Abu Dhabi National Oil Company (Adnoc) said it has awarded an onshore block – known as Onshore Block 3 – to US-based international oil and gas exploration and production company Occidental Petroleum. Onshore Block 3 covers an area of 5,782 sq km located in the Al Dhafra region of the UAE capital., said a statement from Adnoc. Existing 3D seismic data already covers a large part of the Block which, combined with its proximity to the Shah, Asab, Haliba and Sahl fields, suggests the concession area has very promising potential, it stated. Under the terms of the agreement, Occidental will hold a 100 per cent stake in the exploration phase, investing Dh893 million ($244 million), including a participation fee, to explore for oil and gas in Onshore Block 3. Abu Dhabi’s new block licensing strategy represents a major advance in how the Emirate accelerates the exploration and development of untapped resources to replenish its rich reserves base and drives new commercial opportunities, said the statement from Adnoc. Dr Al Jaber said: "This concession award demonstrates how Adnoc is accelerating the exploration and development of Abu Dhabi’s vast untapped hydrocarbon resources. It will help the company to unlock value and stay ahead of the long-term increase in demand for energy and oil and gas products, while further strengthening Abu Dhabi’s position as an essential energy provider to the world. The award also signals our continued and increasing collaboration with US companies." "Occidental was selected after a competitive bid round in which they presented a compelling plan for exploration of the area," he noted. 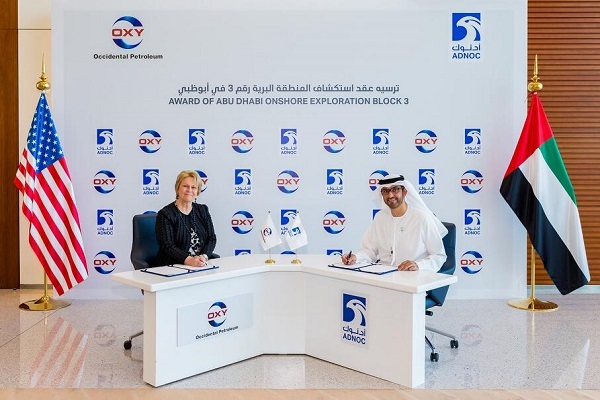 "Occidental is already a joint venture partner of Adnoc’s in the Shah onshore sour gas production and processing, and the award reflects our strategy to develop long-term partnerships with those who want to invest with us across our value chain," said Dr Al Jaber. "It remains at the core of our 2030 smart growth strategy to extract maximum value from Abu Dhabi’s resources, and secure robust and sustainable returns to the UAE," he added. On the contract win, Hollub said: "We are honoured to partner with Adnoc to unlock Abu Dhabi’s vast untapped resources as part of its smart growth strategy. We have had a successful partnership with Adnoc developing the Shah Gas Field and look forward to continuing to work together on projects of strategic importance." The exploration phase will see Occidental leverage – and contribute financially and technically to – Adnoc’s mega seismic survey, announced last year. The survey is deploying industry-leading technologies to capture high-resolution 3D images of the complex geology up to 25,000 feet below the surface and will be used to identify potential hydrocarbon reservoirs, stated Hollub. Adnoc collaborates with Occidental in onshore sour gas field development and processing through Adnoc Sour Gas.